It was in Seattle, Washington in 1948 that entrepreneur Arthur Warn first noticed the number of surplus World War II Jeeps sitting around with nothing to do. So he invented the "locking hubs" that could convert these overlooked treasures into functional on-road transportation. In 1959 the people at Warn saw another need in the market -- consumers needed to pull stuff over rough terrain -- and the Warn Winch was created to meet that need. It quickly became the favorite of ranchers, off-road racers, four wheel drive owners, and just about anyone else who loved traveling off the beaten path. Acquired by Dover Industrial Products in 2003, Warn still makes a complete line of accessories and equipment geared towards the recreational and four wheel drive utility market, but they have expanded their "torque" expertise into the Industrial arena as well. As the proud holder of more than one hundred and ten domestic and international issued and pending patents, Warn continues its history of innovative excellence. If you're the outdoors type with an outdoor vehicle, here are some of the Warn products that might meet your needs. If you don't have a Warn winch on your vehicle, you should probably start looking for a Hotels.com coupon code, as you might not make it home from a day of wheeling. During the Second World War brothers Claude and Rayburn Ramsey had a little business making a variety of parts for aircrafts as well as tool and die parts. Their big customer was Douglas Aircraft. Whether it was due to his sense of a decreased Postwar market or just a simple matter of noticing a lot of vehicles getting "stuck in the mud", one day in 1945 brother Claude went out and designed a crank-operated winch. It mounted right on the front of your vehicle and it really took off. The demand for the original and historic Model 101 was so great that the brothers decided to get out of the tool and die business entirely and renamed the business. The Ramsey Winch Manufacturing Company was born. Today, Ramsey Winch makes a full line of Towing and Recovery, Industrial, and OffRoad products. 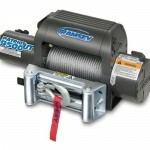 Ramsey makes a wide variety of winches and related accessories for the heavy duty towing and Industrial user, but in the consumer market they are best know for their signature winch -- the Ramsey Patriot. If you recently purchased your first ATV and you are thinking about buying a winch to go with it, stop. There is really nothing to think about. A winch is not a nice "add-on" for an ATV, it is an essential. You have to have one. Think about why you bought the ATV in the first place: to get off the beaten path. Getting stuck in those untrodden paths is an all too frequent occurrence. So how do you determine the kind of atv winch you need? The most critical variable to consider is the weight of your ATV. If you've done a little research here you've seen that winches are grouped by load rating. The most common use for ATV winches is self-recovery -- getting your own vehicle unstuck. So the load you need to make sure your winch is capable of pulling is the weight of your ATV and its assorted gear. Find a place with a "truck scale" in your area, load up your ATV with every conceivable piece of gear you would take with you into the wilderness -- including the beer coolers -- and get yourself weighed. So now you know you need a winch with 2,500 lb pulling capacity or a 4,000 lb pulling capacity. What's next? If you search the Internet for ATV winches you're likely to find yourself "dazed and confused." There are a lot of choices and a lot of differences in price. If you try to make your selection decision by comparing and contrasting the number of product variations in an ATV winch you'll drive yourself crazy. Instead, start here: how much can you realistically afford to spend? Some experts will tell you to first consider how you will use your ATV but we think that is unrealistic in that you won't really know until you get out there and start using it! Many first time ATV owners find themselves coming up with new and different ways to use their ATVs as they become more familiar with their capabilities. However, if you are a weekend warrior kind of user you know you will not be using it as much as if you are a rancher or a farmer. 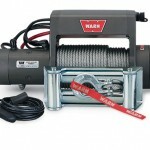 But regardless of use, if the ATV purchase has wiped out your bank account, an expensive winch is out of the question. If budget is not an issue, sticking with an industry leader like Warn is the safest way to go. If it is an issue, there are a lot of less pricey alternatives out there that will get the job done. For normal pulling applications almost any winch will do. The questions you need to ask are how fast will the winch get the job done and how long will it last. Also, what happens if something goes wrong? Lower priced winches use motors that are more likely to burn out than the motors used in more expensive models. 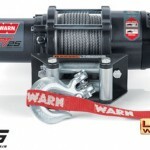 Expect to take a little more time with heavy and long pulls using a cheaper winch. Look for metal, not plastic, parts in the design of the winch. Longer warranties are better, but any warranty is only as good as the customer service behind it, so check the off road forums to see what kind of experiences people have had with the manufacturer you're considering. Finally, once you've purchased your winch the best advice you can get for how to use it can be found in the owners manual. Unfortunately, we live in an age where many just don't like to read but all the tips you need can be found in a good owners manual. Winch Reviews Copyright © 2019 All Rights Reserved .